You believe your horse is ready for his or her first show, but you want to be prepared. While there will always be nerves the first time your horse appears in a show, there are a number of steps you can take to ease the process. Here are a few tips from Horse Channel to make your inaugural showing a success. 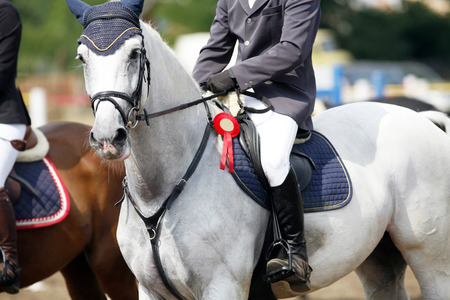 Pay attention to your horse and find a venue that the horse will do his or her best. If the horse doesn’t like noises, a small event may be a better choice. Considerations like that will go a long way toward ensuring a comfortable and successful competition. Even horses that do a lot of work in the ring can benefit by practicing outside. Doing so adds extra distractions from the natural world that horses will need to learn to avoid, so don’t be afraid to try different environments. Take time to rehearse the pattern of the day with your horse and make sure both you and your horse know it cold. Replicate show conditions the best you can, including key elements such as entry and exit areas and the location and size of the judge’s table. If you are rushed and nervous, the horse will sense it. Show up early and give yourself the advantage of having some extra time. By not worrying about rushing to the ring, you can cane more time to make sure everything is perfect and have a more relaxed day all around. Both you and your horse will be better off for it. Yes, it’s fun to have the winning horse, but the first time out can always bring unexpected problems. Enjoy the fact that you and your horse are out competing and use this first time out as an experiment, keeping in mind that this is only the initial test and there will be plenty more opportunities for you and your horse to compete in the future. You want to win, but just think about having fun. That’s what it’s all about. If your horse sense that you’re stressed and anxious, he or she will key off your emotion and feel the same way, which can lead to a less than ideal competition. Stay cool, calm and relaxed and compete for fun, not first. Before and after the show, make sure your horse stays comfortable in a sturdy and reliable horse barn. We offer a range of durable, custom-built structures to house your horses in style. Check out our inventory of barns online now, or call us at 254-546-2276 today.